The Adirondack Mountains of upstate New York are a well established destination for folks who feel the need to escape from the hustle and bustle of every day life and get away from it all. But what is the person who lives here to do to get away from all of those who come here to get away from it all?! We find special and secret places to hide out, of course! This past weekend was one of those instances when I knew the time had come to escape all the exciting, but sometimes overwhelming action in my adopted hometown of Lake Placid. Fortunately, I have discovered some wonderful hidden havens that take the busy right out of me. 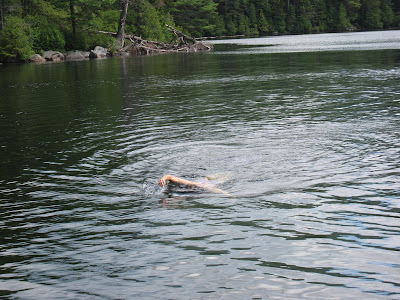 Here are some photos of the great Adirondack swimming hole where, like so many others before me, I found peace, quiet and rejuvenation. Another beautiful place for relaxation are the water falls on the walk out toward Shelving Rock just near the Buck Mountain Trailhead! I have found hours of serenity and engaged in deep meaningful conversation with a giant turtle or two out there. Check out my blog for future rendezvous between myself and the 'Dacks.